208 pages | 3 B/W Illus. "Drs. Quitangon’s and Evces’s collective vision has created a book on a much neglected topic for a field that neglects itself in the rush to help others. No longer can we as disaster mental health professionals so readily overlook helping ourselves, as this book provides the mandate and resources for it to be very much otherwise. Disaster relief organizations should make this compassionate, scholarly, and practical book a pre-deployment requirement." "The experiences of 9/11 left mental health responders with serious wounds and the field of disaster mental health with important questions about how to better protect responders from the effects of vicarious trauma. Filled with fascinating personal accounts by those on the ground, this evidence-based book teaches us about the nature of vicarious trauma and its impact. Most importantly, it gives us practical tools, strategies, and resources to promote vicarious resilience." 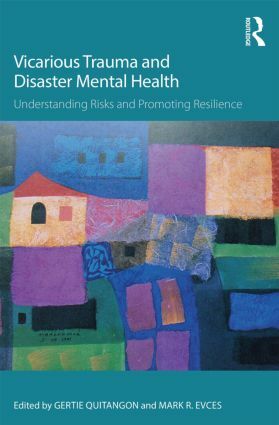 "This book is an unusually comprehensive resource on disaster mental health interventions and the resulting vicarious traumatization that workers may experience. Theory and research are richly illustrated with first-person accounts from those working in post-disaster settings. It is a useful guide for anyone who risks their own well-being to help others recover and accommodate new realities." Gertie Quitangon, M.D., is a clinical assistant professor of psychiatry at the New York University School of Medicine and is on faculty at the NYU Public Psychiatry Fellowship. She is currently the Medical Director at Chapel Street Center, a community-based outpatient clinic of the Department of Veterans Affairs New York Harbor Healthcare System. Mark R. Evces, Ph.D., is a clinical instructor of psychiatry at the New York University School of Medicine and Assistant Director of mental health at the WTC Health Program NYU School of Medicine Clinical Center of Excellence.